My trip to Great Britain and back home to France recently (March 2007) got me thinking of the differences between English and French people. A saying goes that a Englishman's pleasure is doing business and a Frenchman's business is taking pleasure. Too true. An English person doesn't seem to do anything unless there's money in it. A French person doesn't seem to do anything unless there's pleasure in it. For example, sailing. I read from Zen's sailing blog how he got his licence to be a Coastal Cruising Instructor. Sure, this takes place in Northern America and not in Great Britain but seen from continental Europe, it is classified as anglo-saxon behaviour! 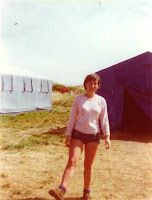 In comparison I recall the way I was taught sailing on an island in Brittany, France, back in 1975 and 76. I know it isn't comparable really but... just as an example of the differences in the two mentalities. Sailing was considered as an art, not a sport and not a business. We were all living together in tents and going sailing on various odd vessels with hardly any instruments in them. The main idea was to be able to sail from A to B with our senses probing our environment. E.g. : to know the wind's direction, we were shown how to place our face into the wind until it felt right. If you felt the wind on a cheek, it wasn't right. The sound in our ears was also an indication. Even a wet finger in the air could be used. It may sound ludicrous. However it did give us the idea that the first instrument was our body and that our brain was able to process a lot of useful information from it. Using our eyes, our ears and the feel on our skin was more important and reliable than reading instruments. I remember also doing a short course on how to 'translate' a chart into a landscape, i.e. how to recognize a landscape compared with what you read on a marine map. Years later, in 1997, when sailing into Malololailai island in Fiji as crew, I was asked to 'recognize' the landscape from the chart as the yacht captain wasn't sure of his bearings from his instuments. It isn't a 'superior' way of doing things. I don't mean that, especially since it is widely known that English folks are the best sailors in the world. It is only a very different approach stemming from a different mentality. I find the English approach is cerebral while the French approach is sensual. It goes for about anything. Wine tasting even. Interesting observation. As an Anglo-Saxon sailor I'm well aware that my approach to the sport is way too cerebral and that I'd be a much better sailor if I developed more of an intuitive feel for the wind and waves and boat. You wouldn't be a better sailor but you'd enjoy it much more. Maybe. Too me the French way sounds more "zen" or what they call here right brain. I learned to sail with Glenans in Ireland, in the mid '70's. I was a young third-level lecturer at the time and I can remember the impact that experience had, not just on my sailing life (which continues), but on my whole approach to teaching - which has ended, professionally at least, with retirement. Who are you? Your profile is not available on google. Let me know!